The options for Brexit "are narrowing", Health Secretary Matt Hancock has said, after MPs voted to seize control of the parliamentary timetable. Mr Hancock said the government would listen to MPs but "can't pre-commit to following whatever they vote for". He told Radio 4's Today programme that the Commons had rejected no deal and a second referendum, and urged MPs to back the PM's Brexit deal. How did my MP vote on 25 March? But the Democratic Unionists, whose 10 MPs prop up Mrs May's government, urged Tory Brexiteers to continue to "stand firm" in their opposition to the prime minister's deal unless there were "significant changes". Their Brexit spokesman Sammy Wilson suggested extending negotiations by a year was preferable to accepting the deal on offer as this would allow the UK to "have a say on the things which affect us during that time". "Surely this is a better strategy than volunteering to be locked into the prison of the withdrawal deal with the cell door key in the pocket of Michel Barnier," he wrote in the Daily Telegraph. On Monday night, MPs voted in favour of Conservative backbencher Sir Oliver Letwin's cross-party amendment, which will allow MPs to put forward motions relating to Brexit - most likely a series of so-called indicative votes. Because of this, MPs will be able to vote on a number of options on Wednesday - likely to include a "softer Brexit", a customs union with the EU and another referendum - designed to test the will of Parliament to see what, if anything, commands a majority. Mr Hancock told Today: "In the previous votes there have been a multitude of potential different options - the sorts of options, like a second referendum, which I think would be a bad idea, that's been rejected. "The idea of having a no deal…the Commons is absolutely clear it won't allow and will legislate against it if necessary. That means that the options are narrowing." Commons Speaker John Bercow said Sir Oliver Letwin will table a business motion at 16:00 GMT and MPs will have until the end of Tuesday to put forward matters for consideration under indicative votes. The exact method of indicative voting will be debated on Wednesday, Mr Bercow said. When asked if the prime minister will abide by the indicative votes, Mr Hancock said it was important for the government to listen to MPs. "But we can't pre-commit to following whatever they vote for, because they might vote for something that is completely impractical," he said. But Labour's Hilary Benn said MPs have to take responsibility for the Brexit process. Mr Benn, chairman of the Commons Exiting the European Union Committee, told the Today programme: "If the government isn't going to do its job then Parliament is going to have to take responsibility, and that is what we are doing on Wednesday." For months, even years now, Brussels has been urging the UK to "tell us what you want, want you really, really want!" And yet there is no sudden outbreak of Brexit joy across the Channel. Even if they did, European Commission chief Jean-Claude Juncker will point out that the EU's only "interlocutor" - or opposite number - remains Her Majesty's government, led by Theresa May, and not UK MPs. Would she be willing to shuttle as a go-between on behalf of Parliament, which has chosen to ignore her negotiated Brexit deal? Not likely. Mr Burt, who resigned as Foreign Office minister on Monday night, said in a statement that he had opted to defy the whip "for the country's sake". He said the UK was "running out of time" to find an alternative and added that Parliament should seek other options without the instruction of party whips and the government "should adopt any feasible outcome as its own". Mr Brine, who quit as a health minister, said he believed the PM's deal was the "best of the options" and for those who do not like the deal "maybe they will realise that the House of Commons is prepared to act and anything from here, as far as they're concerned, gets softer". Tuesday: Theresa May has a meeting of her cabinet. 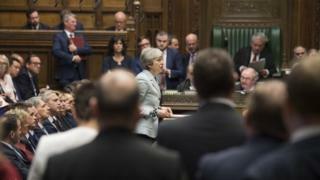 Tuesday had been considered as a possible day for the so-called third meaningful vote on Mrs May's withdrawal deal. But, on Monday, the PM said the deal did not have enough support to get through the Commons "as things stand". Wednesday: This is when indicative votes would be held - we don't know yet whether MPs will be free to vote how they want or be directed along party lines. The prime minister is also due to address the 1922 Committee of Conservative backbenchers. MPs will also vote on changing the Brexit date in UK law from 29 March. Parliament will also be asked to vote on Wednesday on a law postponing the Brexit date from 29 March. Commons leader Andrea Leadsom said the amended legislation would include two potential exit dates - 12 April and 22 May - depending on whether the withdrawal agreement was passed by the end of 29 March.